Acclaimed street artist Swoon, born Caledonia Curry in New London, CT, is known for her intricate portraits depicting the faces of her friends and the denizens of the neighborhoods in which she works. 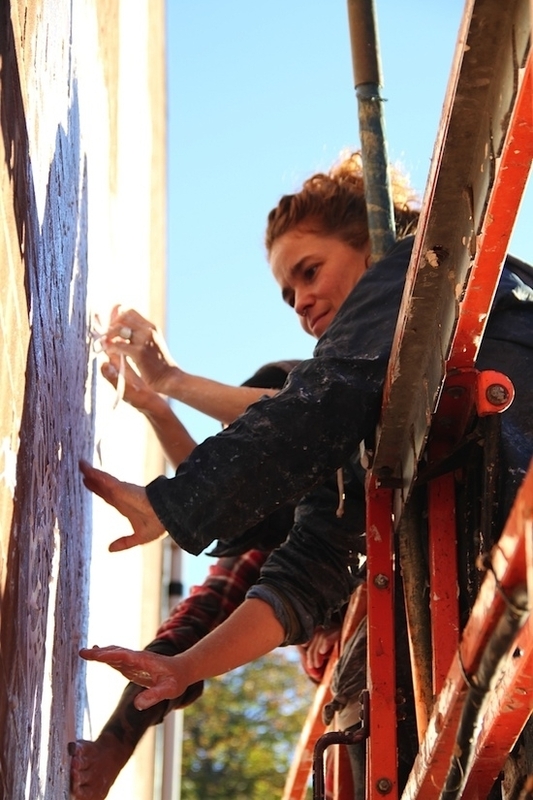 Life-size and frequently adhered to walls and other outdoor spaces, Swoon’s semi-permanent murals have garnered praise from both the street art community and major cultural institutions. Through the use of layered figurative imagery, often metaphorical and archetype-invoking, Swoon’s work probes social and environmental issues. 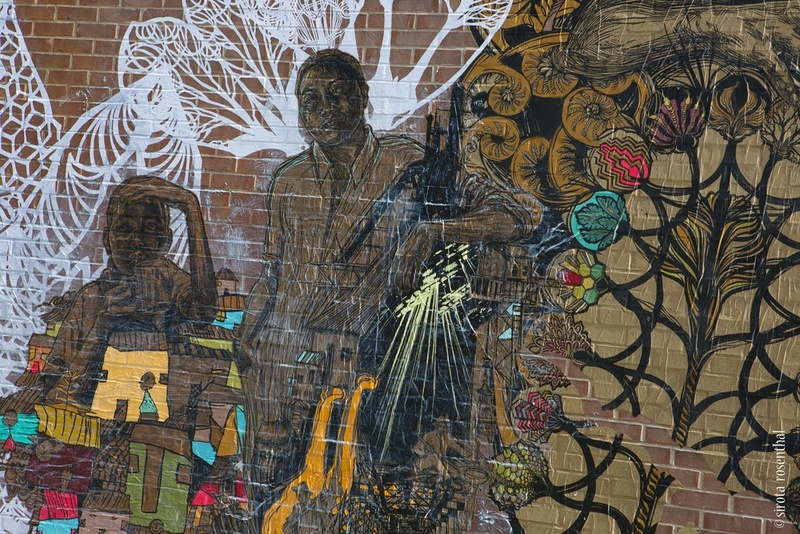 In October 2014, only months after the closing of her mid-career solo exhibition at the Brooklyn Museum, Site Projects invited Swoon to New Haven to install a series of murals around the city as part of their 2014 project: Catalyze + Celebrate:Commissions + Conversations: a series of events exploring “the role of art on place,” and commissioned artworks in dialogue with themes addressed in the conversations. Embedding her work within a neighborhood in the most literal sense and engaging community members as the subjects her work has gone on to inform Swoon’s community-based art projects, including Transformazium (2007-present), in which an artist collective remodeled a vacant church in Braddock, Pennsylvania into a community center for experiential learning and arts-based youth programming, and Konbit Shelter (2010), a sustainable building project in Haiti focused on providing homes and community centers to those displaced by the devastating earthquake. Certain formal qualities in Swoon’s portraits can be traced to the brooding, heavily line-worked style of Ernst Ludwig Kirchner and other German Expressionist printmakers, while the elaborate, lace-like cutouts in many of her forms echo those found in wayang kulit, Indonesia’s rich tradition of shadow puppet theatre. Swoon’s printmaking technique calls for the largest rolls of linoleum that can be found. The artist carves the image into the linoleum rolls, inks the excised linoleum, and rolls out the image on bond paper. She then hand-colors areas of each image. With wheat-paste, an adhesive made from wheat starch and water, the paper is adhered to the the walls. Over time, the elements will erode Swoon’s images, gradually altering their character. Eventually, the images will disappear completely. Dawn and Gemma, the largest piece Swoon installed in New Haven, features as its central image a mother breastfeeding her infant child. The motif of Dawn and Gemma featured prominently in the artist’s 2014 solo-show at the Brooklyn Museum, titled Submerged Motherlands, which took as a major theme the death of the artist’s mother. A hopeful image, the nurturing mother is celebrated as the wellspring of the community. See Swoon work in our Catalyze + Celebrate: Commissions + Conversations video below.